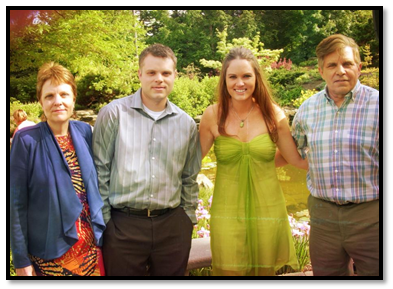 Bryan and Chad started Second Look Flood, LLC in 2011 in an effort to help homeowners understand their flood risk. 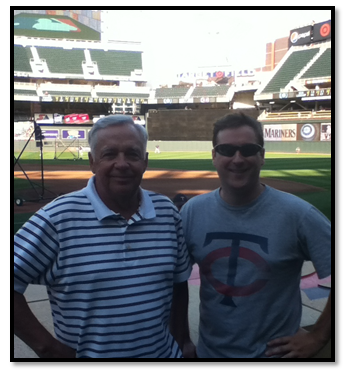 Prior to this, both worked as mapping analysts at a market-leading global information services company. This was a flood vendor providing software and services for flood zone determinations and flood certification. As per the NFIP (National Flood Insurance Program) rules, every time a lender works with a home buyer to get a mortgage or refinance, they need to run a flood determination to find if a home is in contact with a FEMA high-risk flood zone. 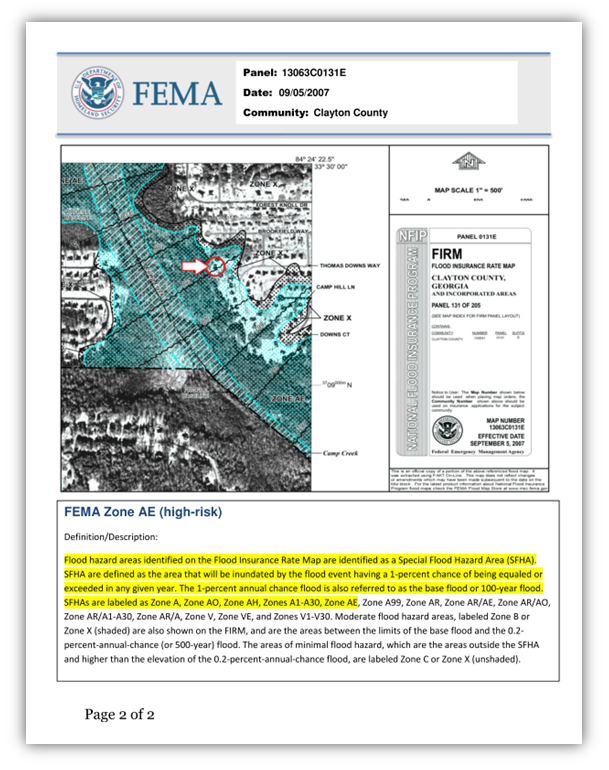 These zones are shown on a FEMA FIRM (Flood Insurance Rate Map). If a home is found in a high-risk flood zone (Zone A or V), mandatory flood insurance is required. As a result the homeowner/buyer is forced to pay expensive flood insurance with little or no evidence of why. Most flood vendors work with thousands of lenders and process thousands of flood determinations each day. They can do this because they use computer programs to map the property and get an instant document in the form of a Standard Flood Determination Form. This is a black and white form typically showing an X or an A. Typically, human eyes will never see the property in question. Since these programs map by proximity, they were often inaccurate. It was the job of Bryan and Chad to support the computer programs mentioned above. For example, if a lender entered the incorrect address, or if the program could not find a property, it would kick the order out to a mapping analyst. They would manually completed the flood determination in this event. Both worked as a dispute manager within the company. Here, they would review a determination if it was disputed or conflicted with another flood determination. Due to the inaccuracy of the computer program, many determinations that were disputed were overturned. As the name suggests, we work with homeowners to take a second look at a home’s flood risk. Bryan and Chad recognized a problem in the industry. Banks and lenders wanted flood determinations fast and cheap. This shortcut sacrificed accuracy. After all, running a flood determination is a minor part in the closing process. The homeowner was often forced to pay flood insurance when it should not have been required. Homeowners were getting the short-end of the stick, and nobody in the industry was willing to work on their behalf. This was the idea behind Second Look Flood. Second Look Flood manually researches each property and provides the same paperwork the bank gets (Standard FEMA Flood Form). 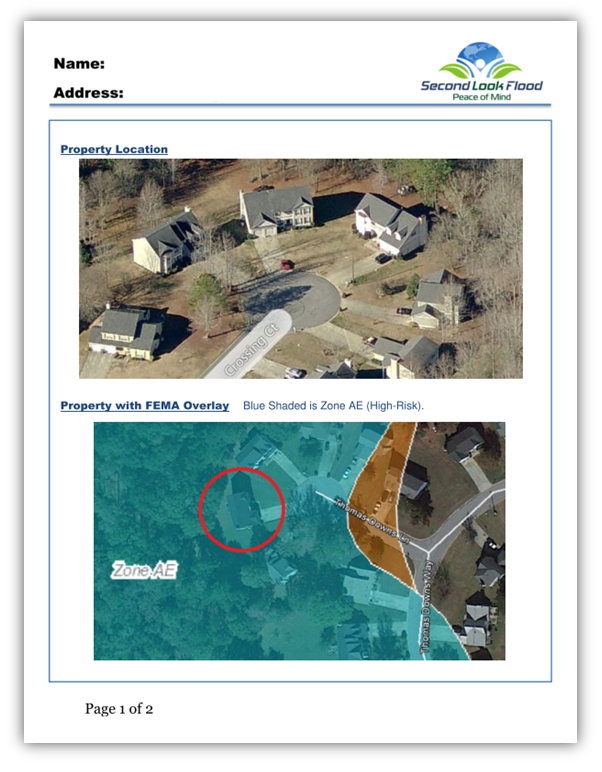 In addition, they can provide a report with aerial images actually showing the property on the flood map as visual evidence to back up the standard determination mentioned. This is the first time a homeowner and lender will see where the property is on the map introducing aerials and overlays. The attention to detail is unmatched. If Second Look Flood can show a home outside the flood zone, the homeowner can use the information purchased to dispute their lender and the mandatory flood insurance requirements. Banks will accept the new information purchased by the homeowner. After all, Second Look Flood is a flood vendor just like the banks employ and supply the same flood zone documents. Lenders really have no choice to accept the information as it is better quality and clearly communicates accurate information. This is something the banks were not willing to pay for in the first place. Many homeowners will find that it is their responsibility to accurately research flood risk and the true FEMA flood Zone. If Second Look Flood agrees with the lender determination, they can show the homeowner why. This homeowner will finally see why it is necessary to pay flood insurance due to their placement on the FEMA flood map. It is unfortunate, but it gives them peace of mind and they appreciate that. Second Look Flood also works with them to discuss their options such as a LOMA (Letter of Map Amendment) where a homeowner can challenge the current FEMA flood map. Feedback for these services has been fantastic! Bottom line– Second Look Flood knows the FEMA, NFIP, and Lender’s playbook. Finally, the general public has access to this important information.